Jabra are ‘bringing back’ Bluetooth! The other week, we covered the Jabra Extreme 2, which is an awesome, subtle, Bluetooth handsfree set. From the same manufacturers, this week we are reviewing a more fun handsfree set, the Jabra Clipper, which allows you to listen to music as well as answer calls. The Clipper comes in five different colours, black, white, orange, blue and pink. 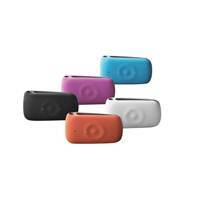 It is designed to clip on to your clothing or whatever else you choose and comes with a pair of earphones. I found it a little bit difficult to clip on to my clothes as it was quite stiff, although, once it’s clipped, you can be sure it’s not going anywhere. The biggest surprise for me, was the quality of sound from the earphones. For a product like the Clipper, I didn’t expect it to be so good! You can’t tell the Clipper is connected via Bluetooth as the sound quality is clear and smooth, as if it’s wired. As with the Jabra Extreme 2, you can connect two devices (eg Mobile and MP3 player) to it and once connected, there is no need to connect again as it has auto-pairing capability. Obviously with Bluetooth, there is always that possibility that you might leave your phone/ MP3 player behind, however, the Clipper comes with an alarm that will sound when your devices start to go out of range – a nice little bonus. You have total control over your music, directly from the Clipper, meaning you can forget about your device in your bag. Talk and music streaming time is a good 6 hours and an impressive 192 hours standby time. Pairing the device is simple and you only need to do it once thanks to the auto-pairing. Overall, I have to say, it’s a nice little gadget. I can see this being particularly popular with the younger crowd and joggers. Jabra seem to be ‘bringing back’ Bluetooth and producing attractive and useful devices that will appeal to a wide audience. Their concentration on sound quality, in my opinion, puts them ahead of their competitors and makes them the best buy. RRP is £49.99 however you can grab an absolute bargain off Amazon at the moment for just under £20.